****A grade will be given for the organization of the binder at the end of the unit. **** All handouts must be organized neatly in the binder. After going to the site above, go to the HANDOUTS folder and the WORKSHEETS folder. For the texts that are used, go to the above website and open the UNIT PLAN AND TEXTS, and download the RC Texts-G6_The wolf you feed.pdf. Or you may download the files below. Students will need to bring their social studies/writing binder to class each day. Many important documents will be handed out in class. It is pertinent that each student put forth much effort to be organized. Please be sure that you also have your homework and classwork, agenda, sharpened pencils, a highlighter, and writing notebook. Students that are prepared earn 20 points each day for a total of 100 points at the end of the week. Example: If a student is prepared five days during the week, the student will earn 100 points. If a student is only prepared 3 days during a week, the student will earn only 60 points. Completed homework is to be placed in the homework folder that coincides with the class period written on top of the folder Folders are found in the metal basket. DO NOT HAND YOUR HOMEWORK TO MRS. LOONEY. DO NOT GIVE HOMEWORK TO A SUB. DO NOT PLACE HOMEWORK ON MRS. LOONEY'S DESK. DO NOT PLACE HOMEWORK BY MRS. LOONEY'S COMPUTER. Place completed homework in the homework folder in the metal basket. Please be aware that each student has the opportunity to make corrections and revisions to homework, projects, essays, and tests to increase your average. Extra credit is always available. Check the homepage of Mrs. Looney's website for extra credit ideas. Students are always welcome to join Mrs. Looney in our classroom during lunch and study halls for questions, guidance, and extra help. Mrs. Looney highly encourages students with missing assignments to come to Mrs. Looney's room during lunch and study halls for assistance until all work is caught up. If students have lost worksheets, directions, etc., lunch time and study hall is a great time to get the extra copies of the work that is missing. However, five points will be taken off each assignment that Mrs. Looney needs to reprint an extra copy. If you have been absent from class for any reason, it is a good idea to join Mrs. Looney for lunch or study hall to find out what instruction was missed in your absence. Students and parents are highly encouraged to check the PowerSchool Gradebook each day to check grades as well as what assignments are late and what assignments are forthcoming. Due Tuesday, January 7, 2014: Homework: Finish reading and filling out the "Reading Closely for Details Checklist." Due tomorrow, Tuesday. PART 1 Objective: "Students learn what it means to read a text closely by attending to and analyzing textual details. Students analyze visual-based texts." Activity 1: Introduction to Unit. As a class, compare the process of "close reading" to the processes used by other experts (musicians, sports managers and coaches, outdoorsmen, scientists, detectives). We will link the above examples to questioning skills used by proficient readers. Discuss the Guiding Questions Handout. Students will put this handout in their binders. Preview the texts that we will read. Go over the Reading Closely Checklist. Due Thursday, January 9, 2014: Homework: Students will re-read the passage (Text #2, A Brief History of Wolves in the United States by Cornelia N. Hutt) and will think about the following question as he/she reads the passage independently, "What words or phrases stand out to me as I read? Why do these words stand out?" Paraphrase some of the details that are noticed. See below for more details. Classwork: Wednesday, January 8, 2014. First, students will participate in a class discussion about the captions and the photos. Compare captions. What details have led the students to come up with the caption? Activity 2: Reading Closely for Details. As we read Text #2, ask yourself the question, "What information or ideas does this text present?" Write the answer to the above question in your social studies notebook. Students will re-read the passage and will think about the following question as he/she reads the passage independently, "What words or phrases stand out to me as I read? Why do these words stand out?" Students will mark the details they notice as they read. Using a highlighter is encouraged. Students will paraphrase one of the details that they noticed. Due Friday, January 10, 2014: Homework: Write a caption for each photo. Write at least five questions for each photo. See below for more details. Activity 3: Looking Closely for Details. "The purpose of the exercise is for students to get a sense of how close examination of texts leads to questions which in turn lead to further examination of textual detail, and an ability to communicate meaning to others." In small groups, examine the image. Answer the question, "What stands out to me as I examine this image?" While examining the image, record the details that are discovered. Record the details in your social studies notebook. Refer to the Guiding Questions Handout to help focus on details. What do you notice about the images and the questions that you had? Were your questions related to the text? In groups, students will list three key details that are essential for understanding something that is going on in one of the images. Each student will write a caption that summarizes what he/she believes the image to be about. Share with small group. Share with class. Compare captions. What details have led the students to come up with the caption? Due Monday, January 13, 2014: Homework: Complete t-chart on loose-leaf. Activity 4: Attending to Details in Multi-media. Guiding questions: "What is this text mainly about? What ideas stand out to me as I view the video?" Go over the captions that were written for homework after analyzing the photos in text #1. What questions do you have about each photo? Notice how these questions are "text specific." Students will list three details that they think are important in helping them understand something that is going on in the images. "The purpose of this exercise is for students to get a sense of how close examination of texts leads to questions which in turn lead to further examination of textual detail..."
Two Wolves, YouTube video by David Owen, http://www.youtube.com/watch?v=E8CHjX8HauA. "Students will think about a guiding question...as they watch the video." The guiding question is, "What information or ideas does this text present?" Students will record details in a t-chart on loose-leaf. Students will record text-specific questions. List details and questions sequentially in the first column. Students will highlight the details that he/she thinks are most important. Explain why they see the details as most important in the second column. Write a few sentences explaining what has been learned from the video. Students will use the Reading Closely Checklist to reflect on what has been learned and to self-assess their ability read closely. What are the differences between watching the video and reading the second version of the legend? What is the difference in how you felt? Due Wednesday, January 15, 2014: Homework: Comic strip with captions. See below for more details. Classwork: Monday and Tuesday, January 13, and 14, 2014. Homework, Tuesday, January 14, 2014: Using the notes and questions that you gleaned from the websites, begin your comic strip. Bring the work that you have completed to school on Tuesday so you can work on the comic strip in school on Tuesday. "Students will use guiding questions to independently explore a multi-media website." Students will use MacBooks to complete this assignment. Write the name of each website on a separate side of loose-leaf. Make a list of specific text-based questions as you analyze the two websites and write the questions on loose-leaf. You will also list facts and information that you have gleaned from the websites. "What do I learn about the topic as I explore the website?" "What interesting details, examples, or ideas can I find that relate to the other texts we are studying?" Make a list of these details, examples, and ideas as you analyze the two websites and write them on loose-leaf. How have my ideas of wolves changed this week? What have I learned about wolves this week? -What have I learned about wolves this week? How have my ideas of wolves changed this week? Be sure to use your notebook and binder to give exact details from the text as you create your comic strip. Due Tuesday, January 21, 2014: Homework: Organized Binder. See above. Announcement: Hear ye! Hear ye! Come one, come all to the Fifth and Sixth Grade Poetry Club. Every Tuesday during lunch time in Mrs. Looney's room. Bring your favorite journal or notebook. Bring your favorite poem. As a class we will go over the fascinating facts that we found on the websites. In partners, students will fill out the Reading Closely for Details Checklist sections I. APPROACHING TEXTS, AND II. QUESTIONING TEXTS. PART 2 Objective: "Students learn to use questions to guide their approach to, reading, and deeper analysis of texts. Students read and analyze informational texts." Activity 1: How Skillful Readers Approach Texts. The teacher will model how to use the Questioning Text worksheet. Then the students will examine Text #2 while utilizing the Questioning Text Worksheet. Students will complete the Questioning Text worksheet in pairs. While working in pairs, students will "select one or two questions to focus on from the Guiding Questions Handout." In pairs, students will read through the text trying to find answers to their guiding question. Guiding each other, students will annotate the text in the margins of the article. After reading the text, students will write a new higher level thinking question. *****"The key skill to work on is having students frame a good, text-specific question that e merges after students have used the guiding question to identify important information in the text." Due Friday, January 17, 2014: Sentences, punctuation, word usage: Use the vocabulary words from Text #5, "All About Wolves" and write the words in a sentence. Please write the sentences on loose-leaf. "All About Wolves" is taken from the Wolves & Moose of Isle Royale website. The documents are found above or can be found on: Downloadable Resources Reading Closely CCSS Unit Grade 6: “The Wolf You Feed” – Zip File of All Documents. Due Wednesday, January 22, 2014: Homework: Complete the Questioning Texts Worksheet. (See the directions below.) This assignment is for a grade to assess how well you understand the role of questioning the texts you are analyzing- before, during, and after you read a text. I will be grading for content, grammar, punctuation, and spelling. I expect that most of the assignment will be completed in class. Bring it home to proofread. Activity 2B: Approaching a New Text, part 2. As students listen to the article for the first time, they will read along and get the "gist" of the article, paying attention to the "flow." As students listen to the article, they will pay attention to the author's message, tone, and use of language. As students listen to the article as they read along, they will annotate in the margins of the text using the Text Codes handout. In pairs, students will decide on a Guiding Question. They will use the Guiding Questions Handout to help form their questions. Students will listen to the article individually and answer their guiding question. After the article is listened to at least once, students will come up with a question pertaining to the text and answer their question. See below for an example. Question: "What are some of the challenges faced by the wolves on the Isle Royale National Park?" Question: "I wonder what I would do if I were the scientist who has to decide whether or not to intervene in this situation on Isle Royale?" Students will complete the Questioning Texts Worksheet. Due Wednesday, January 22, 2014. To be completed in class. Homework: None. Classwork: Students will complete a writing assignment after reading "Q&A: Researcher explains options for near-extinct Isle Royale wolves," Tom Crann ·	ST. PAUL, Minn. ·	Mar 16, 2012. http://www.mprnews.org/story/2012/03/16/rolf-peterson-isle-royale-wolves-q-and-a. The Isle Royale wolves may be on the verge of extinction. Scientists have been discussing whether or not to intervene with nature and rescue the wolf population now or restore the population after extinction. What do you think should be done? 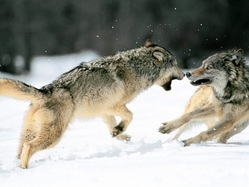 What are some of the challenges facing the wolf population on Isle Royale National Park? Write an essay that states several of the challenges faced by the wolves and whether or not you think scientists should intervene and save the wolves on Isle Royale National Park from extinction. In the introduction to your essay, write a claim stating what you think should be done. Be sure to list challenges that the wolves are facing on the island and whether or not you think that the scientists should intervene with those challenges. List evidence from the text to support your inference/claim. Write as much as you can, as quickly as you can. You may use several sheets of loose-leaf paper. - Write your inference/claim in your introduction. -Use transition words to start new paragraphs and to introduce new examples from the text. -Give at several examples from the text as your evidence to support your inference/claim. Homework due Friday, January 24, 2014: NONE. Homework due Monday, January 27, 2014: NONE. Using all of the texts that we have analyzed, in groups of two or three, students will discuss the most fascinating facts that they have learned about wolves over the past few weeks. Students will make a list of questions that they still have about wolves. In groups or pairs, students will make a poster of the reading/writing skills that they have learned thus far. Homework due Wednesday, January 29, 2014: Questioning Texts worksheet. DO ZOOS HELP OR HARM ANIMALS? RI.5.1 Quote accurately from a text when explaining what the text says explicitly and when drawing inferences from the text. RI.5.2: Determine two or more main ideas of a text and explain how they are supported by key details; summarize the text. RI.5.10: By the end of the year, read and comprehend informational texts, including history/social studies, science, and technical texts, at the high end of the grades 4–5 text complexity band independently and proficiently. We will direct our attention on the issue of whether zoos are helpful or not for endangered animals. Students will begin to fill out the Questioning Texts worksheet before they view the video. Students will choose two to four of the facts that they wrote on their graphic organizer and write them on the Task 1: Response to "Phoenix Zoo Helps Save Endangered Animals" worksheet. The following text is taken from the http://www.myfoxphoenix.com website: "The Arabian Oryx was almost extinct -- but now it's thriving at the Phoenix Zoo. Overhunting and a threatened habitat thinned the herds in the Middle East. The Phoenix Zoo took nine animals to save the species back in the 1960s. The climate and the terrain in the Sonoran desert are very similar to the Arabian Peninsula. In the past 45 years, there have been 239 births. Many of the babies went to other zoos, wildlife preserves, and back to the Middle East. There are now more than 6,000 of the animals in the world. With the success of the Oryx operation, the Phoenix Zoo is getting more involved in preserving other species. Right now they're working with the Chiracahua leopard frog, the Mexican grey wolf and several species of fish. Homework due Thursday, January 30, 2014: Students will read "Zoos: The Historical Debate" and will fill in the compare and contrast t-chart graphic organizer. W.5.1: Write opinion pieces on topics or texts, supporting a point of view with reasons and information. Response to "Zoos: Historical Debate." Students will begin to fill out the Questioning Texts worksheet before they begin reading the article. As you read, ask yourself the guiding question, “Do zoos help or harm animals?" Students will choose at least two symbols from the Text Code sheet to use as they read the article and annotate in the margins. After reading the article and annotating, students will continue to fill out the compare and contrast t-chart graphic organizer in the social studies notebook. COMPARE AND CONTRAST ESSAY RESOURCES: See resources below. ARGUMENT ESSAY RESOURCES: See resources below. ***The above file has all the documents that are needed to read and analyze in order to complete the assignment well. It also has extra resources for additional assistance. THE FOLLOWING HOMEWORK IS DUE ON FRIDAY MORNING BY 8:00 AM. IT WILL BE TO YOUR ADVANTAGE TO HAVE THE FOLLOWING HOMEWORK COMPLETED IN ORDER TO WRITE A POWERFUL ESSAY ON FRIDAY MORNING. YOU WILL MOST LIKELY NOT HAVE TIME TO PLAN YOUR WRITING ON FRIDAY MORNING. BE PREPARED WITH YOUR PLAN BEFORE FRIDAY MORNING. You will need the following resources found above in order to write a powerful essay comparing and contrasting the points of view of whether zoos help or harm animals. We will write the essay in class on Friday. Each student is expected to read, reread, and analyze the five texts that were provided in the "Do Zoos Help or Harm Animals?" packet by Friday morning, 8:00 AM. Read the articles and the graph, and watch the news report. Be sure that the packet is completed including tasks 1, 2, 3, and 4. Task number 5 will be completed in class next week. Task number 5 is not due on Friday. Tasks number 1, 2, 3, and 4 are to be completed as bulleted lists. Be sure to include direct quotes in your bulleted lists. You will want to write down the paragraph number of where you found your quote in the text. Each student is expected to question the texts. Each student is expected to annotate in the margins of the text as they read. Each student is expected to create a t-chart graphic organizer and fill in the t-chart with bullet points comparing and contrasting the details found in the text. Each student is expected to have all of the above completed by 8:00 AM Friday morning. COMPARE AND CONTRAST ESSAY RESOURCES: See resources above. ARGUMENT ESSAY RESOURCES: See resources above. Response to "Zoochosis." An Argument Against Zoos. "It was the sadness in their eyes that has continued to haunt us." Written by Stephanie Santana and Shauwn Lukose. Before reading the article, students will work in pairs to discuss the skills that we have been practicing the last few weeks. Students will make a list of those skills. Students will choose three of the skills that they have found to be most useful to them. Students will discuss why the skills they have chosen are most useful to them. In pairs, students will then continue to practice the skills learned while reading the article. After reading the article and annotating, students will fill out the Task 2: Response to "Zoochosis" sheet. In pairs or groups of three, students will compare and discuss their findings. Students will also discuss whether or not they agree or disagree with the authors. Students will continue to fill out the compare and contrast t-chart graphic organizer in the social studies notebook. In pairs, students will continue to practice the skills learned while reading the article. After reading the article and annotating, students will fill out the Task 2: Response to "Zoochosis" sheet and Task 3: Response to "The Swazi Eleven" sheet. Homework due Monday, February 3, 2014: Be sure that your packet is filled with important, relevant information. Be sure that the spelling is correct. In class, students will complete the compare and contrast essay: "Do Zoos Help or Harm Animals?" See the NYS Standards above. Activity 2: Approaching a New Text. Students will listen as the teacher reads text #5, "All about Wolves," written by John Vucetich and Rolf Peterson, 2012. "All About Wolves" is taken from the Wolves & Moose of Isle Royale website. The teacher will pose a Guiding Question: "What information/ideas are presented at the beginning of the text?" The teacher will pose a second Guiding Question: "What words or phrases stand out to me as I read?" After the article is read at least once, students will come up with a text-based question and answer their question. See below for an example. Text-based Question: "In the first three paragraphs of the Observations, what important details do we learn about Isle Royale wolf pups in their first year of life? Activity 3: Analyzing Text with Text-specific Questions. Students will be introduced to the Analyzing Details Worksheet. What is the purpose of reading this text? Students will read and annotate the text. Students will fill in the worksheet. Activity 4: Posing Text-dependent Questions. Students will use the Analyzing Details Worksheet. Students will highlight details that are relevant to their question. "Students select three details to analyze, copying them and referencing them in their worksheet. Students analyze the details, recording their thinking. Students connect the details, writing a sentence or two explaining their thinking. Students share their findings in a group discussion, using their worksheets to guide their conversations, and reflect as a group on their process of reading closely, using the Reading Closely Checklist as a framework for reflection." "Students will write 1-3 sentences explaining their analysis of the text and list supporting details." PART 3 Objective: "Students learn to analyze textual detail as a key to discovering meaning. Students read, analyze, and compare texts. Activity 1: Analyzing Textual Detail. Read text #6 to class, handout pages 16-23. White Fang, Jack London, Macmillan, 1906. Students will fill out the first parts of the Questioning Texts worksheet focusing on author's perspective questions. Students will "develop text-specific questions about key details." Activity 2: Analyzing Details Across Texts. "Students use their notes and worksheets from texts #5 and #6 to discuss how each author's use of language reflects his or her perspective on the subject." "What is the author's personal relationship to the topic or themes?" "In what ways do the authors' different purposes and perspectives influence their presentation of details and ideas?" Students will work in pairs..."using their analysis of Texts #5 and #6 to come up with a comparative question." Students will "develop a comparative question and individually write a paragraph using their question." -one to two sentences explaining the analysis of text #5. Be sure to add supporting details. -one to two sentences explaining the analysis of text #6. Be sure to add supporting details. -one to two sentences explaining connection that was made between the two texts. Answer the comparative question. Students annotate in the margins of the text as they read. Be sure to note the definitions of the highlighted vocabulary. Definitions are found towards the bottom of each page. Use the Guiding Questions and the Questioning Texts Worksheet. Students will read Text #8, pages 31-37, White Fang, Jack London, Macmillan, 1906. Students will read Text #9, pages 38-44, "Alpha Status, Dominance, and Division of Labor in Wolf Packs," written by David L. Mech, In Canadian Journal of Zoology, published by Northern Prairie Wildlife Research Center Online, 1999. Objective: "Students learn how to summarize and explain what they have learned from their reading, questioning, and analysis of texts. Students read and analyze three related texts. Students will "analyze and write about one of three related texts." Students will choose one of the texts to read closely. See above (Activity 4: Independent Reading). Students will "lead a comparative discussion about the three texts." Students will write about the text that they have chosen to read. In small groups, students will "discuss their writing and draft a question that compares the text to the other texts in the unit." Students will read aloud texts #7, #8, and #9. See above (Activity 4: Independent Reading). What are your first impressions of the texts? Students will chose one of the texts (#7, #8, and #9) to discuss and analyze. Students will use the Questioning Texts Worksheets as they read the text. Students will "complete an Analyzing Texts Worksheet using a text-specific question..."
Students will "use their analysis to independently write a detail-based explanation of one of the texts." -What they have come to understand about the topic from the text." -Reference details related to each of these writing purposes." Objective: "Students learn the characteristics of an effective text-based discussion and demonstrate skills in leading and participating in one. For all of the handouts and texts needed for this unit, go to the link below. For the texts that are used, go to the above website and open the UNIT PLAN AND TEXTS, and download the RC Texts-G6_The wolf you feed.pdf. www.odelleducation.com, "Reading Closely for Textual Details: Developing Core Proficiencies English Language Arts/Literacy Unit." View Text #3, Two Wolves, YouTube video by David Owen. http://www.youtube.com/watch?feature=player_embedded&v=E8CHjX8HauA#!